"I want to push the boundaries of movement with each work and not repeat what I have done before." SIDRA BELL DANCE NEW YORK presents a work-in-progress showing. 8 p.m. Fri., Aug. 9. Pay what you can; limited seating, RSVP required. Pittsburgh's dance community over the past several years has had a love affair with New York-based choreographers. Artists such as Nora Chipaumire, Camille A. Brown and local transplant Kyle Abraham have all established an ongoing presence here through works that have engaged and delighted local audiences and presenters. Another New Yorker whose works have frequented local stages is Sidra Bell. 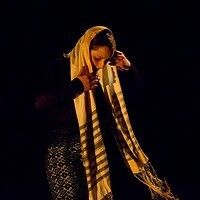 Bell and her company, Sidra Bell Dance New York, introduced themselves to Pittsburgh in 2009, as part of the Kelly-Strayhorn Theater's newMoves Contemporary Dance Festival. She followed with 2010's Revue, then with commissions for Point Park University's Conservatory Dance Company and the August Wilson Center Dance Ensemble. Now, capping this week's artist residency at the Kelly-Strayhorn's Alloy Studios, Bell and company will present a work-in-progress showing of a brand-new creation tentatively slated to world-premiere at the Kelly-Strayhorn next April. Bell, 34, has become a hot commodity, crisscrossing the country creating new works, teaching and, most recently, acting as choreographer for the AIDS-themed dance film Test (www.testthefilm.com). Her company has also been touring more. It was at a recent residency in Philadelphia that Bell says she was inspired to make the work she and the company will create in Pittsburgh. The spark came during the dancers' downtime at a pop-up beer garden, where they engaged in a storytelling game a la NPR's "Wait Wait ... Don't Tell Me!" Each of the company's five dancers told three stories, and their colleagues had to guess which of them was true. Bell says she was struck by two of the stories told. One she describes as "epic," with elements of romanticism and lyricism, and the other as "violent," with religious overtones. Both are themes she plans to explore via the still-untitled new work during the Pittsburgh residency. "I want to push the boundaries of movement with each work and not repeat what I have done before," says Bell, by telephone from New York. The venue that's hosting the residency also plays a big role: Bell sees the Kelly-Strayhorn's openness to artist experimentation as the perfect platform to explore such boundaries. "That kind of relationship is rare," she says.